Former England captain Terry Butcher says Wayne Rooney is developing into a great leader and can score more than 60 goals for his country. 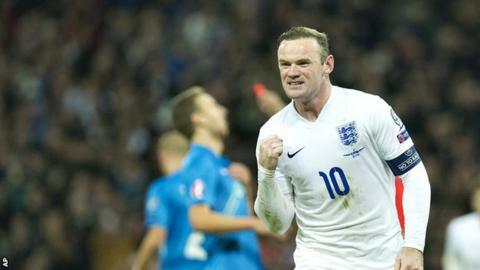 He thinks the effect of the England captaincy on Manchester United striker Rooney, 29, has been immeasurable. "I see him as one of the greats," Butcher, 55, told BBC Radio 5 live's Sportsweek programme. "Sixty goals would be magnificent but I think he could probably go beyond that." Rooney, who took over as captain of club and country in August, took his tally of international goals to 46 with a brace in Tuesday's 3-1 friendly win over Scotland, two behind Gary Lineker on 48 and three short of Sir Bobby Charlton's record of 49. Butcher, who won 77 England caps including seven as skipper, says he has seen a change in Rooney's approach since he was handed the captaincy by England boss Roy Hodgson. "There's even more maturity to his play. He seems to have got a lot of confidence from that armband," said Butcher, pointing out Rooney's goal in United's 2-1 win at Arsenal on Saturday. "Look at the England players around him who can provide chances, we know he's a good finisher who can score great goals as well as tap-ins." Butcher was also impressed with Rooney's influence against Scotland at Celtic Park which followed on from England's win over Slovenia in their Euro 2016 qualifier last weekend. "True to his word, it did happen. They reacted very well to that. As soon as the Slovenia game was out of the way they really got their their minds set on coming out of the blocks quick." Is winning 100 caps still a big deal? Read more on Is winning 100 caps still a big deal?